Foodexposed has previously discussed the EPA approval of 2,4-D and its combination with glyphosate to produce a new herbicide product. A new genetically modified product was recently approved by the USDA despite vociferous protest from environmental groups, concerned scientists and medial professionals and grassroot activists. The International Agency for Research on Cancer (IARC) has classified the popular herbicide, 2,4-D, as a Group 2B, “possibly carcinogenic to humans.” Twenty six experts from 13 countries met at the World Health Organization’s (WHO) IARC in Lyon, France to assess the carcinogenicity of the insecticide lindane, the herbicide 2,4-D, and insecticide DDT. Glyphosate, the ingredient in the popular Roundup weed killer, has been previously classified as a Group 2A “probable” carcinogen, by the IARC based on sufficient evidence of carcinogenicity. The decision to classify both 2,4-D and glyphosate as a possible carcinogen will lead to further protest and a call to the Food and Drug administration to regulate and label these products. In the review conducted by IARC experts, population-based case-control studies of 2,4-D exposure in relation to lymphoma and leukemia were found to provide mixed results. The working group conducted a meta-analysis of 11 studies that shows no association of non-Hodgkin lymphoma with over-exposure to 2,4-D, although the results appeared to be sensitive to whether the studies adjusted for other pesticides. The consensus of the working group was that there is inadequate evidence in humans for the carcinogenicity of 2,4-D, although a substantial minority considered that the evidence was limited. But in animal studies, the group finds that there was limited evidence in experimental animals for the carcinogenicity of 2,4-D, due to methodological concerns regarding the positive studies. Many of the studies under review observed increased incidence of reticulum-cell sarcoma in laboratory mice. In male rats, 2,4-D in the diet induced a positive trend in the incidence of rare brain cancer tumors (astrocytomas). However, other studies provided strong evidence that 2,4-D induces oxidative stress that can operate in humans and moderate evidence that 2,4-D causes immunosuppression, based on in-vivo and in-vitro studies. 2,4-D, one half of chemical makeup of Agent Orange, is highly toxic as it is linked to numerous adverse health effects, including increased risk of birth defects, reduced sperm counts, Parkinson’s disease, and endocrine disruption. Unfortunately, its use is predicted to increase due to the deregulation and expected proliferation of 2,4-D tolerant genetically engineered (GE) crops. Concerns around increased 2,4-D use on GE crops revolves around increasing the onset of 2,4-D-resistant weeds, direct and indirect adverse impacts on human health, increased in drift to non-target sites, and the contamination of food and water. Earlier this year, several conservation, food safety, and public health groups filed a motion challenging the EPA’s decision to expand the use of a new 2,4-D product to be used on GE crops citing serious impacts the powerful new herbicide cocktail will have on farmworkers, neighboring farms, and ground and surface water, as well as endangered species. 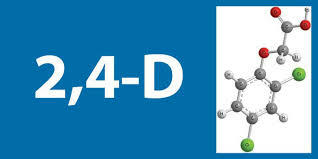 The use of 2,4-D also comes with the possibility for dioxin contamination, which has been a long part of 2,4-D’s history. Expected increases in 2,4-D use means that the frequency of low level dioxin residues entering the environment may also increase. Dioxins are a carcinogenic class of chemicals that have left a toxic legacy for human health and environmental protection across the U.S due to their persistence and toxicity. Dioxins have notoriously long half-lives, are bioaccumulative, and present broadly significant health risks developmentally and postnatally.